From the fine furniture that was produced in Boston, Philadelphia, and Newport to the furniture built by the Shakers, and even good ‘country’ joiners, the years from 1700 to 1850 produced master craftsmen whose work has not been rivaled in form and function since that time. Post & Beam furniture or cabinetry in your home or office reflects your appreciation for quality craftsmanship and the beauty of fine, handmade furniture that will last for generations. Historical reproductions and period-inspired pieces are painstakingly built and finished to make each Post & Beam piece a meaningful and enduring part of your home. 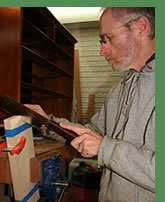 James uses many of the same tools and techniques that were used 250 years ago. He believes this is critical to achieve the appearance of an antique. Considerable time is spent doing handwork on each piece. We enjoy making reproductions of original pieces. But, in order to accommodate modern needs, we are glad to work with you to modify the dimensions, features, or finish of any antique piece. Or, we can simply create a piece to your liking with an antique appearance.